Summary: In answer to the question of what happened following her New York Times bestseller Kabul Beauty School, Deborah Rodriquez is back with a new memoir. It seems like it's been a long time since I read KABUL BEAUTY SCHOOL by Deborah Rodriguez. I guess it has been because a lot has happened in Ms. Rodriguez's life since then. She tells her story in her latest memoir MARGARITA WEDNESDAYS, and it's certainly a doozie! MARGARITA WEDNESDAYS picks up when Ms. Rodriguez was forced to leave Afghanistan in 2007 -- and I mean forced! She ends up in California and she discovers that she doesn't really fit into this community. At the same time, she is dealing with PTSD-like symptoms and spiraling downward with fits of depression. She can barely remember the strong and determined woman she once was -- a woman who showed no fear and opened a beauty school in Kabul. She tries therapy and also tries to heal herself, but she ends up just picking up and driving to her newly purchased house in Mazatlan, Mexico. Keep in mind that she knows absolutely no one there nor does she speak Spanish. Once she settles in Mexico, she meets many wonderful friends; and eventually, despite what she swore would never happen, she opens a full service salon. I was looking forward to reading MARGARITA WEDNESDAYS to see what happened to Deborah Rodriguez, and I have to say that I wasn't at all surprised. That is... after I heard about her scary exit from Afghanistan. I found her story to be brutally honest and quite entertaining, and I was happy that she eventually found peace and happiness in Mexico. I understand why she included so much in this book about her time in California, but I have to tell you that the book really took off for me when she arrived in Mexico. I loved her descriptions of the town, the houses, the restaurants, the food and the townspeople. She did a great job of showing how much she lives this place. While I was reading about Ms. Rodriguez's life, I almost felt as if something was missing. It was a strange feeling to have while reading a memoir to say the least. I think I was waiting for her to open a salon and help the girls (and boys) who were less fortunate. I think that's how I picture Ms. Rodriguez and it's when she is at her best. I debated putting this in my review, but I decided, "Why not?" I had a hard time relating to Ms. Rodriguez in this book. She couldn't be more of my opposite and I felt as if I was constantly shaking my head at her decision-making skills (or lack thereof!) I wasn't judging her, but I was wondering how she came to be this type of daring and carefree person. Fortunately, in MARGARITA WEDNESDAYS, Ms. Rodriguez shared with the reader her process of self-discovery. Much of her childhood and young adult life contributed to her behavior, and I have to say learning this made me (almost) understand her! MARGARITA WEDNESDAYS would make an interesting book club pick. Of course, I'd love the overall Mexican theme possibilities. Just imagine the food and drinks and decorations you could have! There is a reading guide available with fourteen questions along with some ideas to enhance your book club experience. Some of the themes you might want to explore include friendship, mental health, fear, second chances, love, marriage, parent/child relationships, and healing. Overall, I enjoyed MARGARITA WEDNESDAYS. It works as a stand-alone story but I do think it's best appreciated in tandem with KABUL BEAUTY SCHOOL. Thanks to Saichek Publicity and the publisher for providing a review copy of this novel. 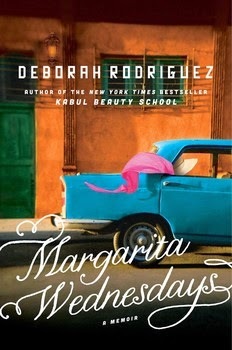 Giveaway alert: I have a copy of MARGARITA WEDNESDAYS to share with one lucky reader. To enter, just fill out the form below before July 10th at 11:59 p.m. EST. I will randomly select and notify the winner the following day. This contest is open to those of you with U.S. addresses only. Good luck! I haven't read Kabul Beauty School so this book will be my first experience with Rodriguez. It sure sounds like she's led an exciting life. I haven't read Kabul Beauty School either, but I can imagine that she's gone through some amazing changes.